Imagine: you come up with the idea for a digital product and create it in just a few days. Then you decide to launch it with just two weeks to plan. When you launch it, it’s wildly successful and you make over $11,000 during your launch week. That’s every digital product seller’s dream, right? Today on Rebel Boss Ladies episode 019, we’re talking to Chelsea Brennan of Smart Money Mamas. She’s an online entrepreneur who actually created a product had an incredibly successful launch after just two weeks of planning. Not only does Chelsea have an AMAZING rebel boss story, she also has some great tips, ideas and strategies on how to make your digital product launch just as successful as hers was. Today, Chelsea runs the incredibly successful blog Smart Money Mamas and she makes a full-time income selling digital products. Like many online entrepreneurs, however, she got her start somewhere completely different. Working as a hedge fund manager in Boston, Chelsea would stay in the office 10, 12, even 14 hours per day. After her first child was born, she started to realize that she was tired of spending so much time in the office. She created a blog to reach out to other young mothers and her moms group. Originally, she couldn’t monetize her blog because of the hedge fund rules. After she had her second child, she realized that the stress of her job was just too much. She decided to quit working at the hedge fund and put her efforts completely into growing her online business. Chelsea says the first few months after she quit her job were a huge transition for her and her family. Chelsea and her husband sold their house and moved in with their in-laws, all while taking care of a two-month-old baby and an almost three-year-old. They then moved to Connecticut to be closer to her mom. During this time, Chelsea was balancing spending time with her family with building her brand and a monetized system for her blog. The transition was stressful, and Chelsea admits that as a natural saver, it was hard for her to not having money coming in. “The only thing that kind of calmed me and still calms me is that we had two full years of funding to not need to make any money,” she admits. She also did some freelance work along with building her own business, to be sure she could support her family. Because she wanted to make sure she created a digital product that would resonate with her audience, Chelsea did some surveying to see what they would like. Chelsea also took this feedback and used it to search the online personal finance space. She looked for things she could do differently and tried to identify what was missing. Chelsea knew that the personal finance niche was saturated and wanted to investigate gaps that she could fill. Chelsea’s connection with her audience paid off in helping her decide what digital product to create. In a blog post she mentioned her “hit by a bus” binder, and got a ton of responses from her readers. They wanted to know what it was and that they needed it, but had no idea how to put it together. This is when Chelsea realized that she had found the perfect product to create. Chelsea took the feedback that she received from her audience and eventually used it to develop her first digital product, the Family Emergency Binder. The product hasn’t always existed as it is today, though. Initially, Chelsea thought she would use the idea to write a blog post and create a checklist opt-in. But when she started creating the product, she realized that it could be a lot more than just a one-page checklist. When she sat down and started to make the product, she realized she had enough content to create a lot more than just a freebie. There was so much to include, she realized that the Family Emergency Binder had to be more than just a checklist. Once Chelsea decided she wanted to turn the Family Emergency Binder into a digital product, she went all in. Chelsea created her product in mid-July, and decided that she wanted to try to launch it on July 30th, giving her two weeks to create a launch strategy. Chelsea did a few things to start building buzz for her product. First, she reached out to people in the personal finance space to get some feedback and help promote the product. From the suggestions of these other bloggers, she developed an affiliate program and found some great affiliates to help her promote her product. She ended up launching with about 15 affiliates. Chelsea also decided to treat this product launch like a six-figure launch, so she could start developing a strategy for future launches. She treated this first launch as a practice product and really targeted her audience’s pain point in her promotion. One of the reasons Chelsea was so successful with her launch is because she created a unique product that solved a pain point for her audience. So what is the Family Emergency Binder? It’s a workbook that gives people the information they need to handle any emergency. Whether it’s a car crash, a house fire, or an illness, the Family Emergency Binder helps you compile all of the information and documents that you need in case of an emergency situation. Chelsea says that the Family Emergency Binder is a tool to give you some peace of mind about potential emergency situations. Most people, when they hear about the binder, realize that it’s something they need but have no idea where to start. This is the pain point that is solved by Chelsea’s product. Compiling all of this information may seem overwhelming and time consuming, or people just have no idea how to approach it. The Family Emergency Binder helps people to quickly and fully prepare for any emergency. She highlighted this pain point in all of her marketing and advertising for her product launch, and said that while it was effective, it was also hard for some people. “The thing that I didn't predict for me for launch week was the number of emails that I would get from people telling me their stories… they saw me talking about the need for this and it was an outlet for them to say oh yeah this is what happened to me.” While this was emotionally draining for Chelsea, she realized that this demonstrated the real need for her product. Because Chelsea’s launch happened so quickly, her affiliates didn’t have time to publish a lot of content. Some weren’t able to publish at all, but instead emailed their lists to promote the product. She helped her affiliates by sending them a lot of different materials, including an onboarding email that explained the product, testimonials, images, screenshots, pins and other advertising content. Chelsea didn’t want to give too much content to her affiliates to copy because she wanted them to promote the Family Emergency Binder using their own experiences. She thought this would be more impactful. During launch week, she checked in with her affiliates three times. The first was on launch day to remind them about the launch, the second was an update midweek about the progress of the launch, and the third was a thank you at the end of the week. Even though her product was low-cost, Chelsea didn’t have any problems encouraging her affiliates to sell. Her affiliates received a 40% commission, and a few were initially very successful in pushing the product. After seeing this success, other affiliates were a lot more willing to sign up. 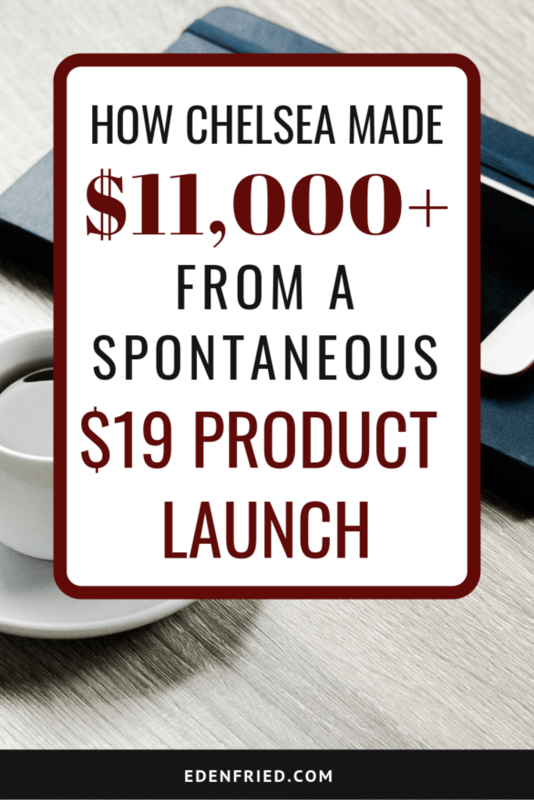 During the launch period, Chelsea grossed $11,023. Initially, she was really surprised about how successful the launch was. Chelsea had no idea that her product, which hadn’t even existed two weeks before, would be such a success. Chelsea recommends to never do hands-on bonuses during a product launch. Even if you don’t think you’ll sell that much, hands on bonuses can take up a lot of time to create. She learned this the hard way. The bonus for the first three days of the Family Emergency Binder launch was a customized cover. Chelsea had to make 280 binders with the family’s name and their chosen colors. Bonuses can be great during a launch, but make sure you have the capacity to be able to follow through. This is especially true for services, like one-on-one coaching sessions. Too many people signing up can leave you overwhelmed or take up all of your time. After her initial launch, Chelsea realized she had to come up with new strategies to target different customers. She saw this as an education process and started reaching out to people who didn’t actually know that they needed her product. Chelsea has educated others about her product in a lot of different ways, from talking about it with friends and acquaintances, to finding new affiliates. She also raised the price of her product from $19 to $29, but she’s often told she could charge a lot more for the Family Emergency Binder. She disagrees with this, because the product is selling like hotcakes and she wants to make it accessible for everyone. Another way that Chelsea found new audiences for her product was through simple Google searches. This helped her bring in more consistent sales. This, along with launching with some new affiliates, helped her to continue to promote the Family Emergency Binder. Even before the launch week was over, people started asking Chelsea about what was next for her business. An idea came to her when she was speaking to a potential customer, who said he wanted to buy the binder but also wanted some kind of course to walk him through everything else that goes along with family emergency planning. She decided to create a course that covers all of these different topics, but first she’s running an intensive program to see what issues people have when emergency planning and use that to build up the course. It’s called “0 to Prepared” and will run in April. Through weekly phone calls, live Q&As and check ins, Chelsea will walk through the process with the participants and make sure that they don’t forget to include anything in the course thats launching in the fall. Chelsea’s already planning for her next launch. Even though she’s doing a lot of the same things as she did during her first launch, she’s planning on doing a few things differently this time around. For her next launch, she’s doing a lot more planning and is focusing on a few different strategies. She’s also giving affiliates more lead time so they’ll be prepared to launch during launch week. This includes giving them more information about the basics of the product and the launch. Chelsea also decided to tease the product a lot more, and there’s already a page up that lets people pre-sign up so they’ll know when the launch is coming. This time, she has a lot more opportunity to plan and build buzz around her product, instead of the two weeks she had to prepare her first launch. Chelsea’s noticed her list has grown a lot since her launch. This is important, because a lot of digital product sellers may not want to launch initially because they think they have a small list. Finally, Chelsea recommends that if you’re launching a digital product, don’t do anything during launch week. Write and schedule everything ahead of time so you only have to focus on the launch during the week.